OhGizmo Review: The Nokia N91 | OhGizmo! Back when the Nokia N91 was first announced, there weren’t too many musicphones with an integrated 4GB hard drive around. At the time, it promised to do right everything that Motorola’s ROKR had done wrong, and some serious amounts of drool dripped from mouths everywhere. No crappy 100 song limit, hell: the N91 promised you the ability to store up to 3,000! 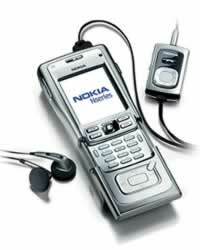 To make things even sweeter, it would come with Bluetooth, a 2MP camera and best of all, WiFi. And even though the long wait between announcement and rollout certainly has dampened some of the excitement, Nokia has managed to execute on all its promises. As a musicphone, the performance is stellar. It’s clear that the N91 was designed as a music device first, and as a smartphone second. Unfortunately, that’s precisely where its relatively few weaknesses lie. For a full review, come right in. Please bear with my pictures: I’m a horrible photographer, armed with a horrible camera. I’ve included some of mine, along with some professional ones. You’ll know which ones are which. The phone itself is a slider, almost entirely encased in brushed stainless steel, save for a small black plastic area around the camera at the back. And while still smaller than Blackberries, Treos or even Qs, it is quite sizeable. Its design gives it a slightly hydrocephalous look that takes a little bit of getting used to, but overall this reviewer was pleased with its aesthetic qualities. It IS big, but not overly so, and especially not considering its functionality. The sliding mechanism is not spring assisted, though the construction is sufficiently precise that just the right amount of pressure is needed to either open or close the keypad; there’s no chance of it accidentally opening in your pocket/purse. A depressed area around the joystick allows you to open it with just your thumb, so one handed operation is possible. The keys themselves, while decidedly small, are very easy to press, even for larger fingers. This is due to them being slim and raised, allowing plenty of room for your finger, and not encroaching on neighboring keys. The keypad is backlit in blue, and looks quite good in the dark. Being a musicphone, the music controls are located on the front of the device, right on the sliding cover. Sadly, they’re completely mechanical, requiring pressure to be activated (not like the iPod’s touch sensitive controls). There’s a dedicated “music button” that brings you to the music interface immediately (more on that later). On the side are the volume buttons, located right next to the appropriately capable speaker. The headphone jack is standard 3.5mm, so you can use any headpiece you like. The included headphones are of good quality, and if used in conjuction with the remote, can double as a handsfree “enhancement”. 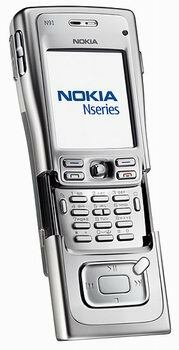 T he one touch that I personally enjoyed, and which is reminiscent of most digital players in the market, is that the keypad lock feature is accessed via a mechanical button located at the top of the device, unlike the regular soft key combination most Nokia phones use. Rounding out the physical properties of the phone is a USB connection on one side, a 2MP uncovered camera at the back and the menu button on the other side. This is good because the menu can be accessed without using the slider. Nokia claims you can fit up to 3,000 songs on its 4GB drive. While this is true, you do have to jump through a few hoops to get there. First of all, you need to use the eAAC+ compression algorithm. The resulting files will sound good, but not great. Not only that, but you better be sure that you got these files from the original CD source; if you attempt to convert your MP3 to an eAAC+, the results will be intolerable. This is normal for a twice compressed file. So, take the 3,000 figure with a grain of salt. Yes, it is technically possible to fit that much into the phone, but a more realistic figure would be around 2,000, even 1,500 if your collection is already entirely made up of MP3 files (as it is for many, many people). Even these figures will require some manipulation and sacrifice some sound quality. At strict average MP3 size, you can fit about 1,000. In the end, the number depends on: 1) Whether you have the original CD and 2) How much quality you want to sacrifice. Getting tunes on the phone is very easy. Upon connecting the device to your computer (either via Bluetooth, or by the included USB cable), you’re given three options: to use the phone as a hard drive, to synchronise via Windows Media Player 10 or to use Nokia’s own bundled software. The hard drive option allows you to simply drag and drop files, while the other two give you a few more options. The bundled Nokia software also includes conversion algorithms, so you can use it to further compress your existing collection, or to rip directly to eAAC+. Like an iPod, the USB 2.0 cable connection is very fast, and transferring songs takes about 2-3 seconds each. The music interface is based on the same structure as the iPod’s. The device reads the ID3 tags, and arranges your collection into “Playlists”, “Artists”, “Albums”, “Genres” and “Composers”. The quality of this classification will of course depend on how complete and thorough your ID3 tags are. The one feature that truly impressed me, and that most, if not all current music players are lacking, is the ability to search. Since it’s possible to enter characters, it’s possible to search for a specific file. This is immensely useful if your collection is large. For example, if you don’t remember the artist, or the album, but only the name of a song, you simply have to go to the “All Songs” sub-menu, and type in the name of the song. As you enter more letters, the list gets smaller and smaller, until the one song you’re looking for is displayed. With the iPod, you’d have been stuck scrolling for quite some time. For this feature alone, the N91 gained a lot of points in my book. Another good implementation is the on-the-go playlists. Again, the presence of a keypad adds functionality that cannot be achieved by regular MP3 players. When you create a playlist, it’s possible to give it any name you choose. Then, you’re given the option of adding songs right away. You’re presented with a list of all your artists, and clicking on one presents you with an indented list of all their songs. Clicking on a song displays a little check mark next to it, letting you know its been added. What’s more, if you change your mind, you can come back to your playlist and delete any songs you like. It is, of course, also possible to add whole albums, or whole artists; you’re not restricted to adding songs one by one. When a song is playing, the album art, if available, is displayed alongside the scrolling title of the song and name of the artist. On my version of the phone, it is possible to set any song as a ringtone, though I don’t know if any carriers may cripple this option, as Verizon seems to have done with the LG chocolate phone. There is an equalizer option: you’re presented with a list of preset settings, and you can manually edit any of these. For the sake of inquiry, I did not compress the beauty out of a few of the songs I transferred to the phone. On these, the sound quality is superb. The lows are rich, and the highs are crystal clear. On the smaller, more compressed files, the quality was good. It would make an audiophile cringe, but they are strange fellows anyway. I did notice a slight hiccupping upon first loading a file (probably as the device caches the data). It’s a minor flaw, but one nonetheless. Overall, I’d have to say the music implementation is superb. 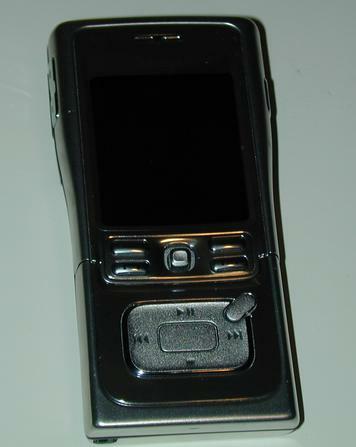 It’s clear that Nokia’s product engineers thought of the N91 as a music device first. From the polished interface, to the ability to use regular headphones, to the inclusion of a 4GB drive, everything has been done to make it an enjoyable music player. This is unfortunately where things get a little more dicey for the N91. Things are a little rough around the edges, and turn what would otherwise have been a perfect phone, into, well, one that’s slightly less perfect. Let me start with the good. The WiFi, for instance, works great. Upon launching the integrated browser, you’re prompted with the option of searching for networks. It displays a list of all the hotspots in range, along with an icon indicating whether the network is secure or not. Simply select your open network, and within seconds you’ll be surfing the web. Unfortunately, it does not save keys. So, if you spend two minutes painstakingly entering a 128 bit key, don’t expect it to remember it next time around. Connection speeds are good, though seem to top out around 50KB/s. Loading a 500KB page takes about 8 to 10 seconds. The integrated browser works quite well. To display a page on the smaller screen, it seems to do a combination of mobile reformatting, and clever visualization. By this I mean, if the page is wide, or long, and you start scrolling, a thumbnail of the page appears, along with a red outline of the area currently being displayed. This allows you to zoom to any part of the page immediately. This being a smartphone, it is possible to download other browsers. I installed Opera Mini, but was somewhat disappointed with both its performance, and its interaction with the N91. It tended to crash now and then, and couldn’t handle splash pages. Some people swear by it, but I preferred Nokia’s own browser. Another good feature, is the 2MP camera. Even though it does not have a flash, like the N70, it takes good quality pictures, provided there is enough light. The video function is also good, capturing decent quality video at around 15fps. What’s great about having a 4GB hard drive is that there is virtually no limit to the length of the videos you take. It compresses to MPEG4 on the fly, so you can fit hours into the drive, provided of course that you have enough space left. Call quality is good, reception is average and battery life very variable. There are many options on this phone that can drain the battery rapidly. If you’re making a lot of calls with a Bluetooth headset, surfing the web with WiFi, and listening to music all at the same time, you’re sure to drain it within a couple hours. On the other hand, if you make just a few calls a day (say, half an hour of talk time), listen to maybe one hour of music, and use WiFi and Bluetooth sparingly, you can go 48 hours without a recharge. If left virtually alone, well, I couldn’t go more than 48 hours without at least making calls. The most notable software design flaw, in my opinion, is the Gallery. After having taken new pictures or videos, and visiting the gallery, the operating system seems to re-index everything. It can quite literally take up to four minutes for the Gallery to display new videos/pics. This is unacceptable, especially if you’re trying to show something to a friend. Also, the phone is prone to freezing randomly. In the two months I’ve been testing it, I’ve had to reboot it a good half a dozen times. It does this mainly when you begin multitasking, and I suspect the amount of RAM onboard to be insufficient. Given that it IS a smartphone, running Symbian v.9, users will want to be able to do multiple things at once: surf the web, while listening to music for example. Also, it presented a few other quirks, such as not hanging up when closing the slider. This happened only three times, but was strange nonetheless. Other times, when a call was initiated, it automatically switched to speaker mode. These are minor flaws, in my opinion, that could easily be fixed with a software update. They are not fundamental design issues (such things would be, for example, the lack of Bluetooth, or the lack of a 3.5mm socket, etc.). Still, they mar what would otherwise be a flawless experience. The N91 set out to be a musicphone, and it accomplishes this with bravado. 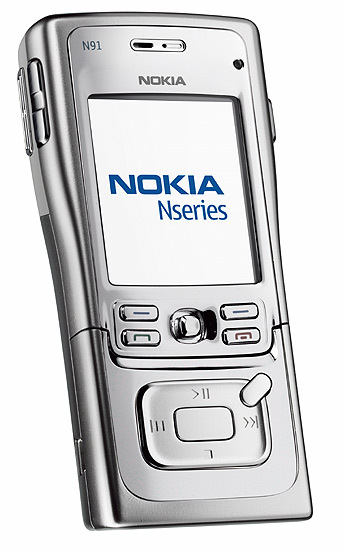 Nokia’s designers thought about making a music player that also happened to be able to make calls, and not about a cellphone that happened to be able to play MP3s. They designed around this premise, and accomplished their mission. Unfortunately, this came at some cost. This being an expensive smartphone, it’s a little disappointing to see some of the phone’s features lack a little polish. Still, the phone is worth it’s weight in gold. As a music player, we give it a 9/10. As a phone, we give it 7.5/10. Finally, folks, whatever questions you might have, we’ll try to answer. So, knock yourselves out. I’m sorry: you don’t consider it a con that this thing doesn’t play mp3s? And that conversion from mp3s has horrible results? Sorry, but I personally didn’t even need to read the review past that section, and I can’t imagine I’m alone. D’oh! Poor reading comprehension: that’s to fit 3000 songs. Never mind. Gah. I’m one of “those” people now. OhGizmo, which professes to be a tad on the geeky side has clearly taken the approach of going through every feature found on the N91 and come up with a very decisive viewpoint on what makes the N91 so good for music lovers and camera fans……. I was really disappointed to read the article in November’s “Smart Money”, in which it is revealed that David is receiving free merchandise from equipment manufacturers. He told the SM writer that the N91 “sucked as a phone” but that perspective oddly did not make it into this review. It’s hard not to wonder about the credibility of the reviews, knowing that information.